Obverse: A castle in the centre; mint mark of Segovia to the left; the coin value II to the right; PHILIPPVS III D G around. 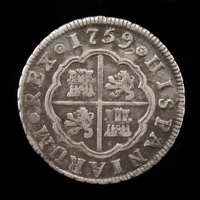 Reverse: Lion facing left; HISPANIARVM REX 1602 around. The mintmark of Segovia is an aqueduct (resembling the letter M).